They are frozen in time and sometimes deceptively real. 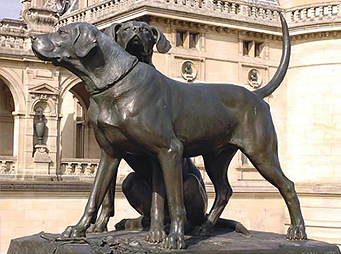 Perpetuated in stone or bronze, looking over water, streets, parks or squares, dog statues can be found all over the world. The French Château de Chantilly is situated in Picardia, about 60 kilometers north of Paris in the Nonette River valley, where a moated fort controlled the route from Paris to the Roman town of Senlis in northern France during the Middle Ages. During and after the French Revolution (1789-99) the town of Chantilly was developed west of the château. The château as we know it today is a 19th-century reconstruction made by order of Prince Henri d’Orleans (1822-97), youngest son of Louis-Philippe I (1773-1850), King of France from 1830-48. Henri donated the château and art collection – paintings, antique books, manuscripts – to the Institut Français (that promoted French culture), under the condition that none of the collection should ever leave the château. The art collection of Henri d’Orleans is the second largest in France, second only to the one in the Louvre. Posted by Alex on Jan 28 2019. Filed under Current Articles, Featured. You can follow any responses to this entry through the RSS 2.0. Both comments and pings are currently closed.